Bloom is a game demo, produced as part of a course at Futuregames Academy in Stockholm, Sweden. Bloom is a vertical slice pitch demo for a game, produced as part of a course at Futuregames Academy in Stockholm, Sweden. 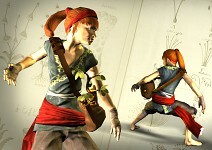 The demo was developed by a group of eight students in about six weeks (2010), using primarily Unity and Maya. At the end of the course, this project was, in competition with several other projects, awarded the first prize by an industry jury.